A more detailed version of this guide is now available. 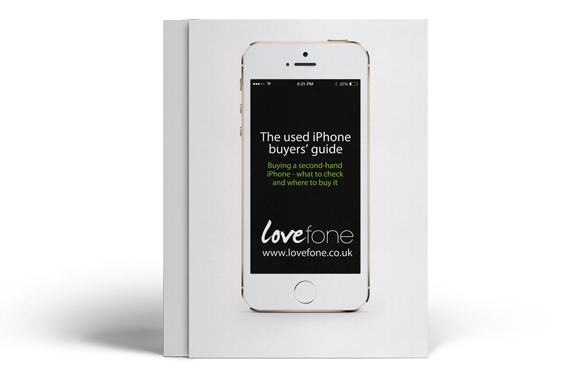 Please go to http://www.lovefone.co.uk/the-used-iphone-buyers-guide to download it. A friend of mine emailed me the other day asking for some iPhone advice. He wanted to buy a second hand iPhone but didn’t know what to check to make sure it was working OK. It’s a good question, as used iPhones can suffer from a wide range of problems and faults, some of which are hard to spot on first inspection. To help, I made a small checklist for him, which I’ve expanded further below. Using this checklist, you can test most of the functionality of the iPhone and I hope it will also help you with the buying process. First of all, if the iPhone has a case, remove it and check the iPhone’s cosmetic condition. Look for scratches and scuffs. If it’s an iPhone 3G or 3GS looks for cracks in the back case around the headphone jack and dock connector – in particular, it’s very common for there to be vertical cracks rising from the bottom of the back case (above the charging dock). Test the power button, home button, silent switch and volume buttons. The home button of the iPhone 4 is prone to failure but we can replace it for you if need be in 30 minutes. If possible, insert your SIM card to make sure the iPhone works on your network. Make a phone call. By doing this you will test the microphone and earpiece. If you have a headphones with microphone and remote, use them to make a phone call to make sure the headphone jack is working. If you have a laptop with you, connect the sync/charge cable and check that the iPhone charges and that it is detected by iTunes. Another thing to test is the wifi. Go to Settings > Wi-Fi and turn it on. See if it detects networks around you and compare, if possible, with another iPhone. Go into the Maps app and tap the arrow in the bottom left corner to make sure the GPS is working. Sometimes it might take a few seconds to get an accurate position via GPS as the iPhone first uses wifi networks around you to get the location. Play some music to make sure the speaker is working. By the way, the iPhone has only one speaker (the other grill contains the mic). Using a torch, look inside the headphone jack and dock connector. The iPhone has water sensors which are white but turn red when in contact with water. Please note that these sensors might turn pink because of moisture in the air. Test the cameras on the front and back. Also, record a short movie as the iPhone 4, iPhone 4S and iPhone 5 have a different microphone which records sound while filming. This microphone is also used to improve the sound quality during phone calls. Another thing to test is the LCD screen. Start Safari and open a blank page. Using the white background look for dead pixels. While you’re here, test the 3G connection (if you can) by going to your favourite website. Also, turn the iPhone into landscape mode to test the accelerometer. Test the brightness of the LCD screen. Go to Settings and tap Brightness & Wallpaper. Move the brightness slider to the far right to make sure the backlight is fine. You can also check the warranty status of the iPhone. Go to Settings > General > About and look for Serial Number. Then go to https://selfsolve.apple.com/agreementWarrantyDynamic.do, enter the serial number and press Continue. You will then see whether the iPhone is still covered by Apple’s warranty. After running these tests you should know whether there’s something that doesn’t work as it should. Through running these checks, my friend discovered that his eBay purchase was in full working order – and just required some simple headphone jack fluff removal! While some tests might reveal severe problems, we can replace most of the components and restore the functionality. So please get in touch if you need any help.